Ouachita Electric Cooperative Corporation's 76-acre, 12 megawatt solar farm in East Camden accounts for roughly 20 percent of its production. 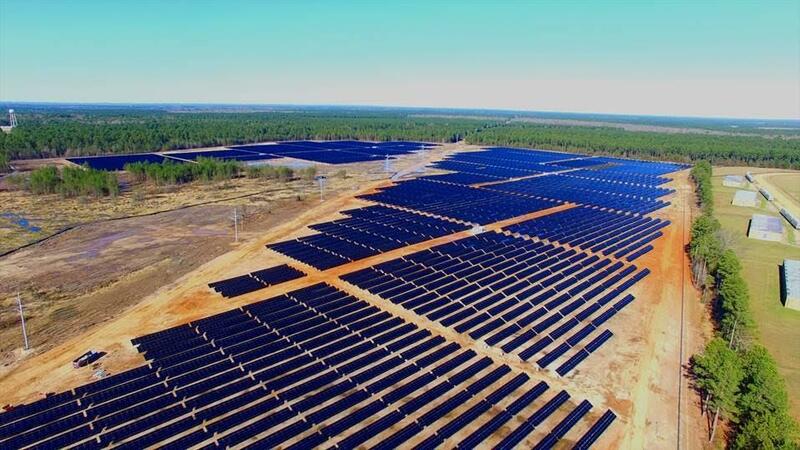 It's by far the biggest solar power system in the state of Arkansas, but bigger outfits — Entergy, for instance — have their sites set on 100 megawatt farms that would comprise a substantial part of their production as well. Futurists have long foretold of two energy “unicorns,” sources that are as abundant and non-polluting as they are competitive in the marketplace. The dreamier of these is nuclear fusion, fuel to the stars! It chews up abundant hydrogen — nine out of every 10 atoms in the galaxy — and spits out helium, the stuff of party balloons. The second energy unicorn is the next best thing to harnessing the power of a fusion reaction, and that’s harnessing the power of a fusion reaction from a safe distance of 93 million miles, or the distance from here to the sun. Back on earth, inside the Arkansas state Capitol recently, the Arkansas Alternative Energy Commission heard presentations from a couple of contractors who would like to see more photovoltaic solar panels on more Arkansas roofs. Peter Rienks with Inovateus Solar in Indiana showed commissioners a website that ranked Arkansas dead last in the nation for solar energy adoption and incentives. That’s 51st out of 50 states and the District of Columbia. Behind West Virginia and Wyoming, two unapologetically coal-loving states. SolarPowerRocks.com gives the state a failing grade in tax credits, exemptions and rebates for installing solar energy technology, as well as its Renewable Portfolio Standard (states’ requirements that utilities fold renewable energy production into their operations). In short, the state does nothing to encourage solar energy adoption, and what’s more, the retail price for a standard unit of electricity is about ten cents a kilowatt-hour, a rate so low it’s inhospitable to innovation. In fact, the only thing we do moderately well is offer net metering, the industry term for solar and wind energy producers who add electricity to the grid (thus dipping below zero in energy consumption and earning credits with your utility provider.). Raising the price of net metering for residents is currently being debated at the Public Service Commission, and there is a public hearing at 8:30 a.m. today. Rienks said after the meeting that Arkansans should demand incentives because the state is actually above average for solar energy potential. In fact, he said the state has more solar potential than Louisiana and Florida. Solar resource maps from the National Renewable Energy Laboratory don’t corroborate that. Instead, Rienks’ should have pointed out that Arkansas’s utilities, municipalities and residential net metering customers are — together, and quite independently — creating a swell of solar production projects over just the last several months. This spring a 151,200-panel, 76-acre solar farm went online in East Camden for Ouachita Electric Cooperative Corporation. How big is this — electrically, symbolically? 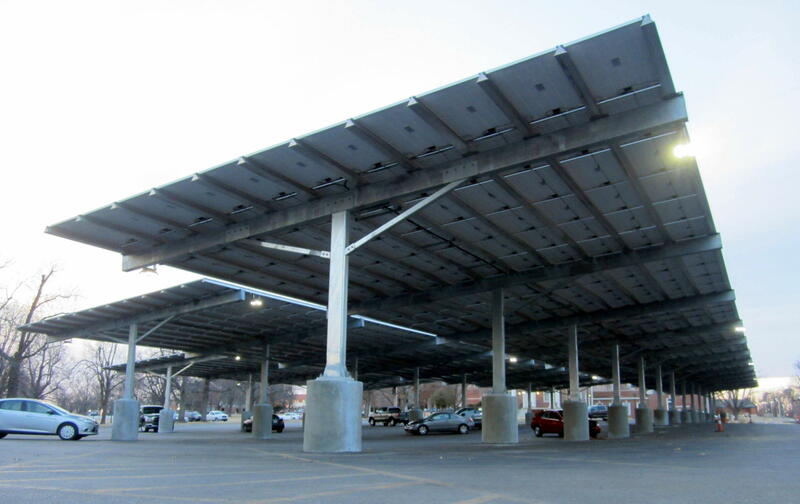 The biggest solar operation in Arkansas had been the 266-kilowatt solar system at the Veterans Health Care System of the Ozarks in Fayetteville, metered for Southwestern Electric Power. The 266-kilowatt solar system at the Veterans Health Care System of the Ozarks in Fayetteville, metered for Southwestern Electric Power. At peak solar, the East Camden facility produces 12 megawatts, more than 45 times as much as the VA, and fully one-fifth of the southwest Arkansas Cooperative’s total generating load. This subscriber or lease program is not the first of its kind, just the first utility-owned lease program. Bill Ball’s Stellar Sun has a much smaller (50 kw) “aggregated solar,” or “community solar,” system in Scott that he shares with a few others. He would like to expand it to 150 kw. Bill Ball, founder of Stellar Sun, interviewed inside a KUAR-89.1 studio. Ball says many homeowners want the benefit of cheap solar electricity without the down payment, which is about $3-$4/watt, and without the maintenance of having it secured to a residential rooftop. Ozarks’ lease is $340 per panel. Each is 25 years, and Scarbrough says a panel may generate $1.85-$2.80 a month savings over the life of the lease. So the investment returns roughly 12-14 years in. Larger players are also seeing clear skies ahead. L’Oreal U.S.A. just announced a partnership with former state Lieutenant Governor Bill Halter’s Scenic Hill Solar to build a 1.2 megawatt solar field at the makeup company’s North Little Rock manufacturing facility (and an even bigger one in Florence, Ky). 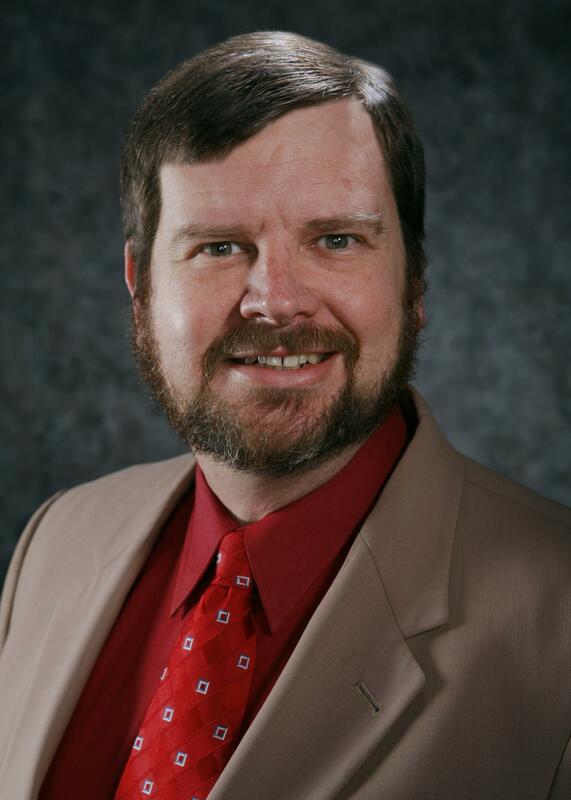 Kurt Castleberry is director of resource planning and market operations for Entergy. And that’s just industry. The number of net metering customers in the state who’ve installed their own photovoltaic solar systems has jumped 237 percent in the five most recent years of reporting (2011-2015). Each year the state’s electricity providers (Entergy, Oklahoma Gas & Electric, electric cooperatives, etc.) list all of their net metering customers, residential and commercial, for the Arkansas Public Service Commission. In 2011, the total number of small solar power producers was just under 200, many with a generator rating of less than one kilowatt. In 2015, the total was 464, many of those systems rated for more than 10 kilowatts of generating capacity. “Tipping point is a good way to describe it,” he says, because interest and optimism is rising as costs are dropping. 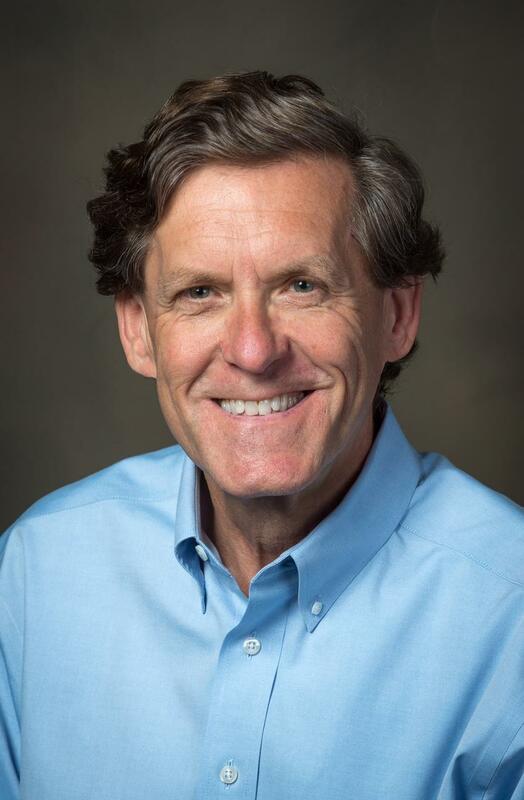 Terry Tremwel is an adjunct professor at the Sam M. Walton College of Business at the University of Arkansas and the chairman of Picasolar, Inc., a solar cell innovation company in Fayetteville. Solar panel technology still has a lot of cost-saving, energy-generating efficiencies to implement — what Picasolar is all about. In other words, if utilities, with the benefit of their energy divination, are lining up for solar, the time to buy is now. “The sweet spot for solar is between now and 2020,” Ball says, when federal tax credits will phase out. Orlo Stitt is something like Ball’s counterpart in Northwest Arkansas. Stitt began his energy-saving residential construction business four decades ago, and his company is the contractor Tremwel’s using for his house. Stitt says one of the surprising bottlenecks on solar adoption is the scarceness of trained people. We simply don’t have technical schools teaching state-of-the-art energy systems installation. He also says that in Arkansas, those private citizens adopting energy-generating photovoltaic systems are doing so because of their consciences. “Conscience, and climate change problems, anticipation for their children and grandchildren, are the main motivations, still. Here,” he says. Halter said L’Oreal’s announcement earlier this month proves that solar will compete without the incentives heretofore required by businesses. 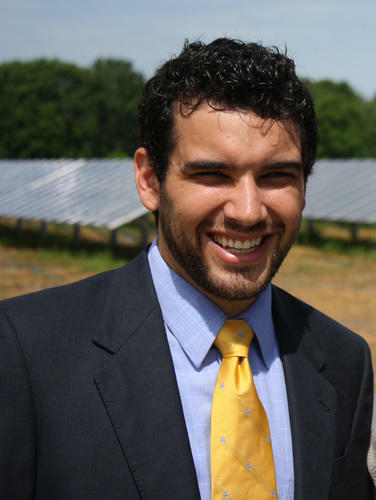 Bill Halter founded Scenic Hill Solar in 2015. He means solar, and one requirement, OK, the requirement, is a bright sunny sky. Two associations representing the oil and gas industries are holding a joint meeting in Little Rock this week. Members of the Arkansas Independent Producers and Royalty Owners, or AIPRO, are meeting with the Interstate Oil and Gas Compact Commission, which describes itself as a “multi-state agency.” The meeting takes place staring Sunday Oct. 2nd and will end Tuesday Oct. 3rd. Cosmetics maker L'Oreal USA is building thousands of solar panels at manufacturing facilities in Kentucky and Arkansas, a move the company says will help cut carbon emissions and create two of the biggest solar-powered projects in each state. 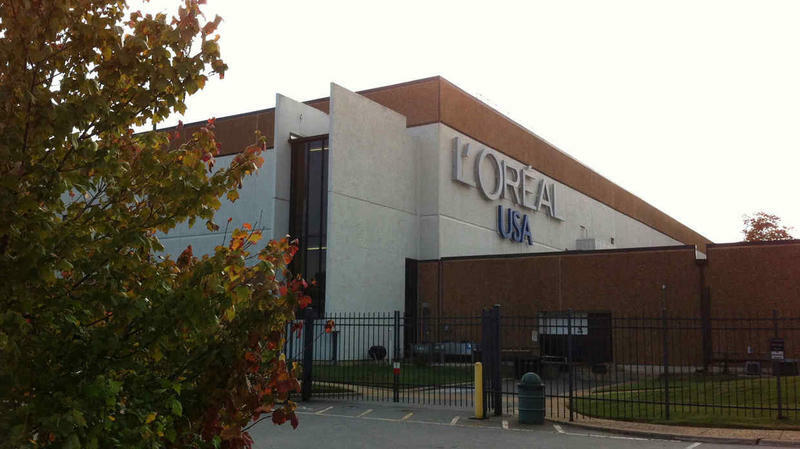 The subsidiary of the L'Oreal Group said Tuesday it plans to install 5,000 solar panels at its Florence, Kentucky, plant and another 4,000 at its North Little Rock, Arkansas, plant, with both projects expected to be operational by the middle of next year. 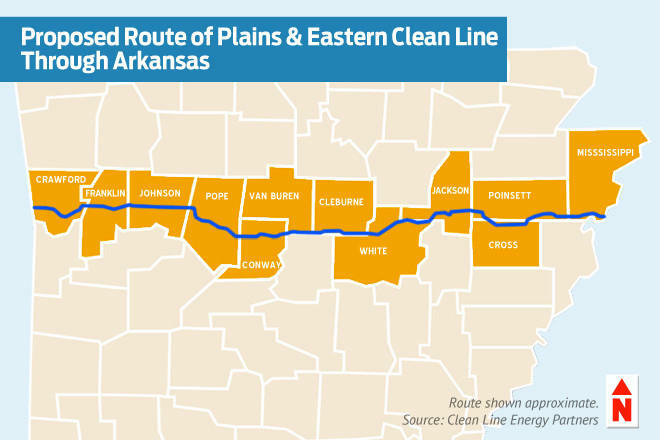 Federal lawsuits are pending over a project to build a transmission line through Arkansas delivering wind energy from Oklahoma to the Memphis area. In this week’s issue of Arkansas Business there’s a closer look at the arguments involved in the case involving two groups of landowners who would have to sell property. Who wouldn’t support a project that promises to bring cheap, clean power to 160,000 Arkansas homes along with hundreds of jobs and tens of millions of dollars for state landowners and schools?